Do You Want to Learn Hand-lettering? 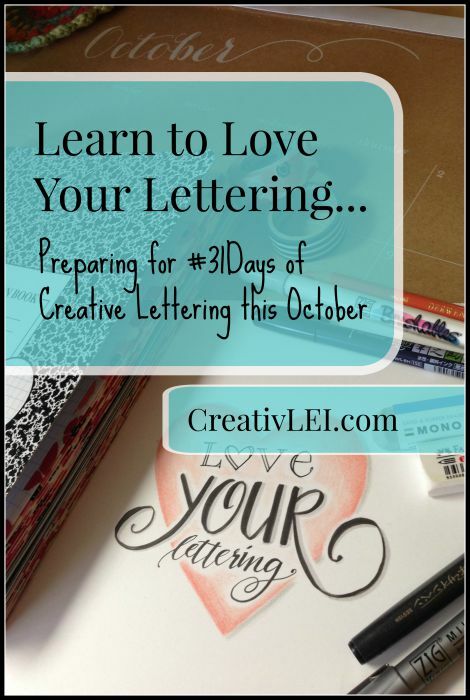 Join me in October for #31Days to Love Your Lettering! I’m gearing up for another October attempting to answer the challenge to #write31days. You’ve seen me attempt it before… and I’ve never fully completed it. This year I have a little more built in accountability because I’m using these 31 days for YOU! Many have asked me about my hand-lettering and calligraphy. Let’s dedicate October to improving our penmanship. I use lettering in everything, from decorating envelopes to my journaling bible, and many of you want to learn how to do creative lettering or improve your handwriting. Yup, totally old school! Short lessons and Periscope sessions! I know you don’t have lots of free time to devote. So each day the lesson or tip will be short so that you can complete it in 10-15 minutes, if that’s all you have. I’ll be broadcasting some of the lessons on Periscope so that you can ask your questions directly! Photo tutorials are great, but LIVE instruction is even better. Weekends will be for finding inspiration and practicing what we’ve covered during the week. 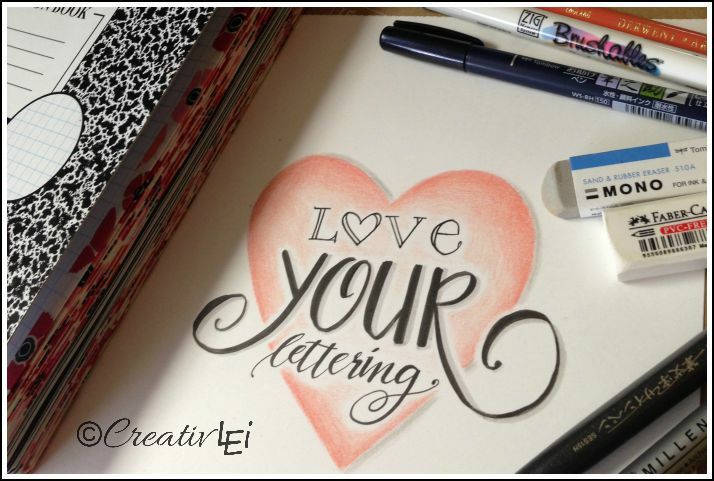 What do you need to start lettering? A quad rule composition book – This is by far my favorite type of notebook for practicing. The grid is really helpful for spacing and layout. I like the Tops brand because it doesn’t have any info printed on the inside of the cover. But if you can’t find that, any quad ruled composition book will work (Staples, Walmart, and Target often carry them). Washi tape– I used 2 rolls of Scotch Expressions Washi tape, to tape together 2 sheets for each page to prevent bleed-through. (I’ll be explaining that fully on October 1!) Just a warning, if you’ve never bought washi tape… they have a way of building into a collection. There are TONS of cute designs! Fine Tip Art Pens (black)– My two favorite brands are Zig and Sakura. You can buy them individually at most craft stores, but a set can be purchased inexpensively and the variety of sizes will be helpful. Soft lead pencils– A #2 (HB) pencil is okay for this series, but a ‘B’ pencil is softer and will erase a little easier. I usually use a 4B for marking out layout and for lettering practice. You can buy a couple different lead pencils individually at Michaels, Joann, or Hobby Lobby. Black Calligraphy Marker– I love the duo tip calligraphy markers, the Staedtler marker was the first one I used back in junior high! The Zig works well and has a fine and broad nib. Sakura’s Calligrapher set is another option, the nibs are nylon instead of felt. Brush Pen(s)– I LOVE my Tombow brush pens. If you are brand new to modern calligraphy, you’ll want to try these. We’ll be talking all things brush lettering starting October 19! I was recently able to find a Pentel Sign Pen at Michaels, that is another good, inexpensive option. Watercolor set– contrary to what you think I’m going to say, a cheap set works great. My two faves are from Yoobi (Check your local Target, it should be less than $2 in-store!) and Prang. The multi-color set from the craft store was much too chalky for my preference (having more colors isn’t necessarily better). Colored pencils– I have Prismacolor pencils and they are wonderful (and worth the investment if you want to wait for a sale or coupon), but if you just want colored pencils that will work well and give you a little color flexibility, the Crayola colored pencils are a good alternative. Water brush(s)– I have a few different ones. You really only need one or two, I’d recommend a small and medium. Glaze pen– When we talk about the resist technique, these are the pens I’ll be using. I think that’s everything. Well, maybe not everything, but definitely a good start for some awesome creative lettering! Questions about anything on the supply list? Ask here and I’ll do a scope showing you each item! « When is it Time to Quit Homeschooling? I figure that spreading it out over a month into small bits will help us get into the habit of practicing daily. To me, hand-lettering is part art and part skill, which means everyone can try it. I’m looking forward to October with you all. How do we join in for the 31 days? Thanks for asking, Gigi! I’ve added a subscription form that will allow you to subscribe to just this section (just the Hand-Crafted category) of the blog for daily updates. I don’ see any confirmation in email…just an error message. 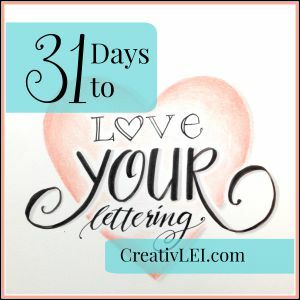 Having trouble subscribing to the 31 days for lettering, I see the email & name boxes, but there is nothing to click after that. Looks like something worked – I just got an email to confirm. I’m sorry there was some trouble. I just set up that list tonight. Hopefully that’s the only glitch. I’ll send out a test post this week before the 1st, just to be sure I’ve got it set right. 😉 Thanks for joining me! How can I confirm I signed up? When I clicked out of the form after writing my last name, it vanished, so Iassume it went through? I am SOOOOO excited for this! I want to journal, but my drawings are never good in a Bible, so I read and then draw on a notebook to match my Bible. I started hand lettering about 7 months ago while my son was in NICU. I’ve fallen in love; its an addiction within itself. Thank you for sharing! Sheila, I’m trying to keep this as easy as possible for everyone to join in that just wants to be more comfortable and proud of their own handwriting and lettering. I’ll be giving tips on how to use certain pens for different styles as well as talking about the basic components of letter forms and how small changes create our style. I hope you’ll give it a try. I’m having the same issue as Tammy did. I only see the email info but nothing to click to send. I love hand lettering and want to learn more, but I always give up after a few hours of practice. I’m hoping this will be the incentive that I have needed. Looking forward to it. I had trouble signing up too…no button to click. Please sign me up though, I’d love to take part! What does the inside of the quad rule composition book look like? Amazon doesn’t show an inside view. I’d love to sign up but I can’t find the “subscribe button” to send my info??? Can you please help? 😉 Thank you!! Thank you for offering this class! So excited to get started, gonna have the hubs get ,all my supplies today😊 I’ve been looking for something like this. Thanks! i have filled in your subscription box but there is no button to send. I would love to register for the 31 days of lettering but cannot submit my information. I just tried to sign up also and entered my info, but no where to go from there. Nothing to click to enter. I would like to know if it’s free or not. Hi, Luisa. Yes, it is a free series of posts that will be right here on the blog! Thanks for following. I can’t find a submit button, please add me to the class. Thank you. I can’t see where to submit my name for the class. I put all my info in but I don’t see a submit button! Help! I would so love to subscribe to this course, but there is no button to enter after completing my details. Please advise how we can subscribe to your course. Hopefully hitting enter or send has given you a confirmation email in your inbox. Let me know if it hasn’t worked. I’m sorry about the confusion. Love the idea for this class! I want to join, but am having the same troubles as Tammy–am not seeing a submit button. Am I overlooking something? I can’t find a button to click to sign up, after enter my email and name. I’m trying to subscribe, but there isn’t an “enter” button to click after I type my information. I am having trouble signing up for this. I have tried several times with no luck. I really want to take this challenge. Hoping that by posting this comment I’ll see the 31 days of lettering. ☺ looking forward to it! I entered my info the the month long lettering instruction, but there is no enter button to send in the info…HELP please…thanks. I tried to subscribe to the 31 days of hand lettering but not sure if it went through. Can you let me know if my information was received? Thanks! Looking forward to learning! Don’t know if the above email was added as there is no button to press after you fill in the subscription stuff. Hi Lisa. I tried to subscribe but there is no button to click after I add my information. Please add me to your list. Thanks! It is a free series I’ll be hosting right here through daily posts. If you can not see a subscribe button in your browser just hit enter or send when you’ve added your email and then check your inbox for a confirmation email. Let me know if it hasn’t worked. Not able to subscribe to the 31 days of lettering. There is nothing to click. I entered my info but there is nothing to click to send it? Hello, I would love to sign up for your lettering class! I could enter my info in the boxes, but it would not submit (I checked my e-mail to see if I would receive a confirmation, but I did not). I’ve tried to subscribe, but I can not submit it. There’s no submit button. I can’t subscribe. There doesn’t seem to be a submit button but I would love to participate. Not sure how to subscribe, I entered email but there was nothing to click. Hope it went through. So excited for this, Lisa! Setting up my binder and supplies tomorrow. Hurry up and get here, October! I am trying to sign up for the October hand lettering course. Can you make sure I am added. Thanks! Did you use the same email address as this comment? I do not see this email address on the list. Thank you, Lisa. I’m looking forward to this class, and I have shared the link with friends who may also join in. Lisa – do you see my email on the list??? I do, you’re there. Go ahead and unsubscribe from comment notifications. That should help you stop receiving those notifications. Sadness! Filled out hit enter and no confirmation e-mail. Please let me know if I am signed up or not. Appreciate your time. Sorry if I am doing something wrong. Sheila, you are showing up on the subscribed list. Not sure why you’ve not seen a confirmation. I’ll be sending out a test later today. Karen, I’ve entered you manually. There will be a test message sent later today. Thanks for your patience. It has been a little crazy. I wasn’t expecting such a huge response. Hopefully the new sign-up form works better. I entered yesterday. It said to confirm the sent email. I never received a confirmation email. Christal, did you receive the email today with the new post? I’ll be publishing the new post each morning. As for Periscope, I’ll broadcast at night (Eastern time), but I’m not setting the hour in stone. Six children in the house means I usually wait for them to be in bed. 😉 So happy to have you joining. The Katch videos will be available as soon as the broadcast ends, and I’ll be embedding them right on to the corresponding post. This is a GREAT post! Thank you so much for partying with us at LEarning from each other. I love your blog! I’m off to subscribe and browse a little more! Welcome. Hope to get to know you more through the month. I have a whole lot of pencils and no sharpener. Any suggestions? I have one for the soft pencils that are coming. Great question, Judy!! I’m always on the hunt for a really good sharpener. This one is on my wishlist, I just haven’t purchased yet http://amzn.to/1FMEg2z. I use the small metal sharpener that come with my Prismacolor pencils most of the time. We have this one mounted to the wall http://amzn.to/1P92Ixa, but it’s not always great at sharpening straight. I’m really particular about my pencils. I’m going to pick up this one this weekend to try, http://amzn.to/1FMF0on. I’m doing the 31 day blog and don’t have time or resources to do the course now. I’d love to participate if you’re ever teaching it again. Especially after The holidays. Donna, the series (and the embedded videos) will remain on my blog after the month is done. Feel free to come back at any time to catch up! Wishing you the best as you #write31days!! Thank you. That’s generous! I’ll tell my niece also. She’s very artistic with her writing. I just found this and am really excited. Something I have always wanted to learn. Thanks for generously offering to teach for free!! I have some catching up to do. Thanks, Kari. I feel privileged to share this with all of you. I have terrible handwriting & am excited to see if it could be any better. I clicked the subscribe button, got a return email, & got a message that I’ve been subscribed. Yay!! Now I don’t know what to do. Since it’s after October & I’m not following along with you, I’m skeptical that I’ll be getting daily emails. So…. I just don’t know how to access the practice. 🙂 Thanks so much for posting this “class”! Hi Susanne, Welcome! You are right, there are not currently daily emails, since the ‘live’ portion of this series has completed. I do not have a system in place to mail out the posts daily, but I intend to look into that in the coming season. In the meantime, I would suggest pinning the index page and going through at your pace. Those subscribed to Love Your Lettering will only receive email when new lettering items become available. I’m working to streamline things a bit better this year. 😉 So glad you’re here. Just wondering if you will be offering this workshop again….I just found it on Pinterest and have recently been practicing my handwriting. Your workshop sounds workable….10-15 minutes a day can easily be squeezed in! Actually I just started another live session of the series on Periscope, we started March first and we’re currently on our weekend catch-up. The next demo will be on Sunday (2:30 and 9:30PM Eastern), where we’ll go of Refining Your Handwriting. Each assignment is designed to be a quick exercise. Hope you’ll join us. II it too late to start? It’s never too late. These posts are always accessible. Let me know if I can help in any way.